In recent years health food crazes have gone completely mad. Super foods, clean eating and similar trends are what all the cool kids want to talk about and everyone’s got their own take on it. I’m not knocking it at all, our health is extremely important and it’s great that so many people want to jump on this band wagon, but I’m certainly not going to start pushing my own philosophies on you. Different methods, lifestyles and routines work differently for every single individual and I think it’s best to take from all of these ideals the bits and pieces that work for you. What I take from it all is that it’s made me consider what I put into my food a lot more carefully. With all these new trends, new ingredients and new dishes have been introduced into my culinary repertoire and variety is something that’s really important to me. One of the ingredients that’s become more and more popular and more readily available to us in recent years is quinoa. It’s a great alternative to rice and cous cous and most certainly feels lighter on the stomach. One of my favourite uses for quinoa is to bulk out a salad and turn something that could be considered a snack or small lunch into a more substantial meal. It bulks out a dish without feeling as stodgy or heavy as rice. 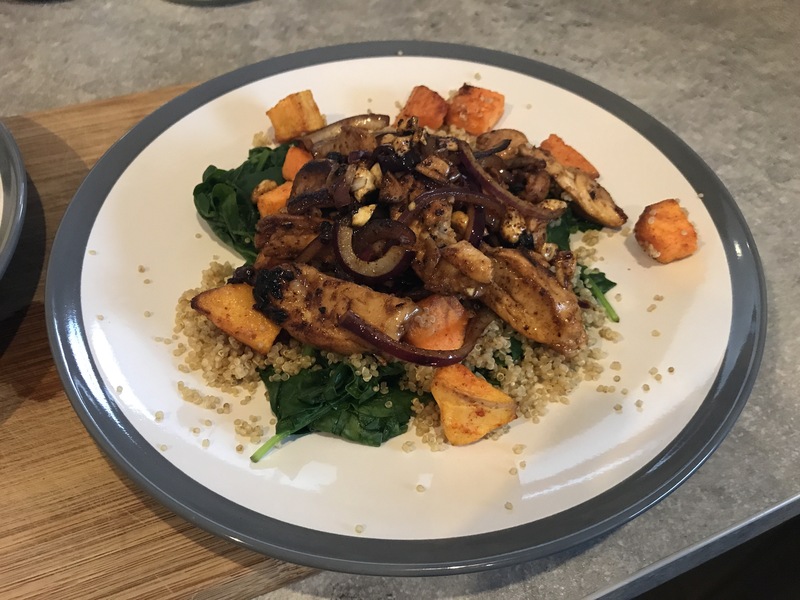 I created this dish out of the need to use up half a bag of spinach and half a packet of butternut squash leftover from a few dinners earlier in the week and quinoa was the perfect additional ingredient to turn this into a proper meal. Of course, simply grilling the chicken would have made a tasty dish, however I happened to be reading the ES magazine on the train home which featured a similar marinade to this one which inspired me to raid the cupboards for ingredients to make something similar. 2. Mix all of the marinade ingredients and completely coat the chicken thighs. Cover and leave to marinate for approximately 30 minutes. 3. Meanwhile in a bowl thoroughly coat the butternut squash in oil and paprika. Spread on a baking tray and roast for 20 minutes. 4. While the chicken is marinating and squash roasting, bring 400ml of salted water to the boil and add the quinoa. Cook for around 15 minutes until the grains have softened. 5. Place the spinach in a colander in the sink and pour over boiled water to wilt the leaves. Leave to drain and squeeze out any excess water when cooled. 6. The quinoa and butternut squash should be nearly ready by now. Drain the quinoa, remove the butternut squash from the oven and set aside until you’re ready to dish up. 7. Bring a large frying pan to a medium heat, there is no need for any oil as there is plenty in the chicken marinade. Fry the chicken for approximately 5 minutes on each side until cooked through. 8. Remove chicken from the pan and slice into bite sized pieces. 9. Add the onions and the nuts to the pan and cook for a minute or two before returning the chicken to the pan. Cook for a further minute or two until everything is coated in the sauce from the pan. 10. Arrange the spinach, quinoa and butternut squash on a plate, top with the chicken mixture.